This century-old home sits atop a knoll on Dewey Lake. The house is of the Italianate style with ten foot ceilings and bay windows both upstairs and down. It has six bedrooms and square footage is approximately three thousand sq feet. Francis A Dewey walked into Lenawee County, "on foot and alone" in 1829 when he was 18 years old. He came from New Hampshire and was a stagecoach driver. He and his family were farmers and were the first owners of 682 acres with 14 land patents in Lenawee County. 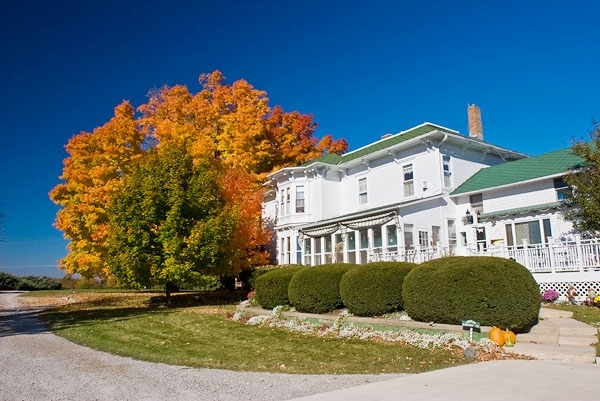 Albert Francis Dewey ,one of the sons, built the big white house on Dewey Lake in the late 1860's, which today is now Dewey Lake Manor Bed & Breakfast and is celebrating thier 20th year in business. With over 400 ft of lake frontage the manor offers paddle boats, canoes, and a fire pit for an old fashion bondfire. canoe and a bonfire pit. It's also a great place to xcountry ski in the winter.